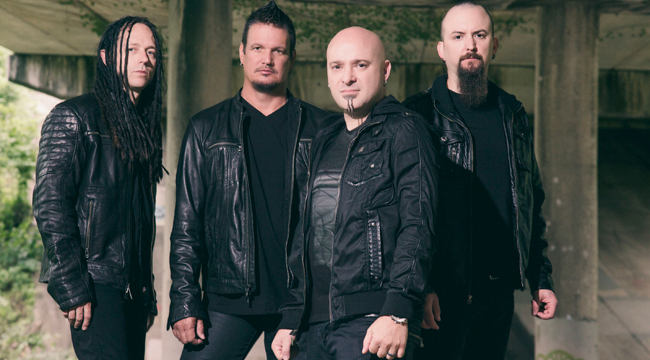 Last year, the multi-platinum hard rock band Disturbed returned with Immortalized, its first studio album in five years. 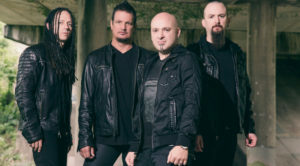 The album includes a rendition of the Simon and Garfunkel tune “The Sound of Silence” that retains the original’s somber tone while adding singer David Draiman’s distinctively raspy vocals. After weeks at No. 1 at rock radio, the song has charted at mainstream radio and has sold almost a million copies. The video alone has 65 million views and the band’s performance on Conan has become one of the show’s most popular musical performances of all time. Drummer Mike Wengren spoke from his Milwaukee home where he had just returned from a three-week European tour. Start by talking about what brought the band out of hiatus. We stepped away from it for a little bit. It was getting to be too predictable for us. Things were great. But it was a constant cycle of write, record, tour and repeat. It was amazing, and I wouldn’t change a thing but after so many years of not taking any time off, it started to get close to feeling like it was punching the clock. We felt like it was best to step away from it and pick it up when it felt like it was right. It was great to get away. Anyone who works a 9 to 5 day in and day out knows it it’s good to take a vacation. We decided to step away and it was great to home and raise our families. Some of us got married and had kids. Some of us were coaching our kids’ football teams. It’s still a huge part of who we are. We started hitting each other up and talking about getting together. We flew out to meet each other and had a meeting to see where everyone’s heads were at. We wanted to start writing. We thought the last few records were missing something. Because we live in different states, we started sending files back and forth. That did the job but we decided to go back like it was before technology took over. We just wanted to go in a room and write and play together like we were a local band again. That’s what we did. It was awesome. We felt like we were rekindling the energy we had when we first started out. The vibe was really killer. We didn’t want to have the pressure of a timeline. We decided to not tell anybody. We wrote and wanted to have that luxury of doing it on our own time. Before you knew it, we were in the studio recording and the record was done and here we are again. It’s been almost a year now. You were playing together as a band before David Draiman joined the group. How did he end playing with you guys? We were a local band back in the day in Chicago. We put an ad out in a bunch of papers, and he came walking in. At the time, we were doing a lot of covers. A lot of guys knew this or that cover. That was great, but we had originals too. We would give guys a cassette tape of our originals. We did the same thing with David. He walked in and wanted to know what originals we had. We offered to give him a tape and have him come back in a week. We just played one right there. He just started scatting to one of the tunes and it was magic right off the bat. I know it’s a cliché but it pretty much went that way. What was the Chicago scene like back then? At the time, the alternative pop rock scene was really big with bands like Smashing Pumpkins and Local H and stuff like that. We were not part of that crowd. It started to become challenging to try to build a following. In the downtown scene, unless you knew somebody or you were welcomed into that clique, they wouldn’t book you. We were from the South suburbs and there were plenty of bars we could play. We just focused on that. We had a friend in another band who had his foot in the door and they gave us an opening slot at the Metro and that kicked the door open. All our fans came to the show and you couldn’t deny their passion. The Sickness became a huge hit. What was it like to become so popular so quickly? For us, we had been doing it for several years before that. It wasn’t as overnight as it seemed. There was something about the connection we could make with our fans, whether it was early on or now. We can make a connection. We sing about real things and write about real things and everyday life experiences. To this day, fans tell us they’ve used our music to get through difficult times in their life, which is an amazing thing. It’s been the case since Day One. Talk about the songwriting process for Immortalized. When did that begin? We got in a room together. Danny starts us off with riffs. I had a set of drums right there. I just started playing beats. We just encourage each other. You can tell whether or not it’s working. When it does, the hair on the back of your neck stands up and it just builds. We start out with guitar and drums, and David throws some kind of rough melody down right away. In the past we had a close relationship with Johnny K and the city and the studio, but this time we wanted to get out of our comfort zone. We wanted to recruit a new producer. We had an interview process with some of the top guys in the business and for whatever reason, we felt Kevin Churko was the right fit. We started playing with him and he seemed to get what we were. We lived at his studio in Vegas for four months and spent the whole time in the studio. Trying to keep it a secret was difficult. We didn’t even tell some of our family members. It was a challenge to not be seen. It was exciting for us to drop the record out of the sky when the fans weren’t expecting it. On the album’s release day, you played your first show in four years at the House of Blues in Chicago. What was that like? It was amazing. It was a lot of anticipation. It had been several years since we played together on a stage. We had a few rehearsals leading up to it. It was a nice, intimate setting. It was great to kick it off that way. But because we kept it a secret for so long, we couldn’t tell promoters that we were coming back. We couldn’t book any shows and had to wait for the record to drop until we could start booking. We didn’t get out and start doing touring until February of this year. We’re still just getting started on the road. We’re firing on all cylinders and we got plenty left to go. What prompted the cover of “The Sound of Silence”? Every time we’re in the studio, we throw ideas around. It goes back to when we were a local band and liked playing covers. For whatever reason, nothing was coming across. One day, I threw out Simon and Garfunkel and “The Sound of Silence.” We were getting very personal and emotional on this particular record with songs like “The Light” and “Save Our Last Goodbye.” We had a good friend of ours who contracted pancreatic cancer and then nine months later he was gone and left behind three young kids and his wife. It hit home with us. We were in a vulnerable place. I brought up the ideas and the guys thought it was great. It’s daunting to think about how we can tackle the song. It’s one of the best written songs of all time done by legends. We didn’t want to disgrace the song. We just started to experiment with it. It was Dan’s idea to go down the orchestral route with the haunting piano and strings. We knew David’s voice was capable of delivering a performance that would carry the song. We could have gone back to what we’ve always done with covers by adding chunky guitars but we wanted to give this a shot. The more we worked on it, the more it took shape and we just fell in love with it. I can’t believe the ride it’s taken us on so far, performing on Conan and having it featured on Dancing with the Stars. It’s crazy, some of the outlets it’s been on. Do you think the band falls into any specific genre? I think it’s hard to put us any specific genres. Everyone likes to label things. We don’t fit in just one area. We’re generally just a rock band. Some people call us hard rock or heavy metal. If you listen to “The Sound of Silence,” that’s not a metal song per se. That’s one of the things I love about the performance. It’s redefined the categorization of the band. I don’t know exactly where we fit, but we like it that way. Do you think the band will continue to write new material? We’re just getting started. I know the record has been out for a year now, but we have a lot of touring under our belts for this cycle. We are very invigorated right now. We have a fire under us. I think we want to ride this thing out until it’s time for the next break.